Walk.Bike.Schools! is a blog, meeting (7pm Thursday @ Bryant Elementary library) and (hopefully) a movement to support and encourage parents and kids walking and biking to school. Our mission (though calling it such seems a little grand right now) is to build a network of parents, neighbors, members of school communities, and yes, students, who can share ideas and energy around the goal of encouraging more kids and families to bike to school—at least some of the time. Our loose group of ~6-8 parents has been reasonably successful—Bryant won SDOT’s Golden Shoe award for the largest number of students regularly arriving on foot or bike last year. But we know things could be so much better if we could tap into the collective intelligence of other bike and walk programs in our city and learn what as worked (and not worked) elsewhere. So we came up with this kind of selfish idea. You help us reach our goals of getting more kids out of cars and onto bikes or feet. But then again, it’s not totally selfish—we’re also here to share our success, failures, and ideas with you and hopefully help you make your programs a little better, too. Because ultimately our goal isn’t just to get more kids out of cars in our neighborhood — it’s to get more kids on foot and bike all over Seattle! What’s the state of your program? Maybe you have a core of walkers and riders—a regular bike train or a walking school bus—but you think there’s potential for more. You just need inspiration, or some new ideas (or both). But don’t sell your program short—you probably have some great ideas and wins to share, too. Come to the meeting, write a blog post on WalkBikeSchools, and add your photos to the Walk.Bike.Schools flickr pool. 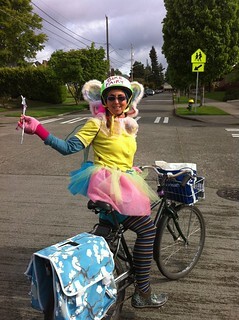 Because Seattle schools’ walkers and bikers need to hear from you! Or maybe you’re just starting out and don’t know where to begin. You’re hoping to find out about Safe Routes to School grants and Bike to School Month. You have some ideas for getting kids out of cars and dialed into human power, but maybe need a little support from some established schools. We need you too! Come to the meeting, comment on the blog or ask for feedback on the s0on-to-come listserv! Chances are one of us has the info you need and would be happy to share. It doesn’t matter if you’re at either end of the spectrum or something in between. We’d like to build a community of people supportive of bike and walk programs but can’t do it without YOU. Please come to our meeting Thursday (4/12) and get involved. And if you can’t make the meeting keep watching the Walk.Bike.Schools Blog. We’ll post a recap there and ideally start highlighting posts from contributors at schools all over the city (contact me if you want to write something). And share your photos of kids walking AND/OR biking to school, event posters, and more on the Walk.Bike.Schools flickr pool. Images of kids in action and examples of promotional ideas are great inspiration for all of us! This entry was posted in bigger than here, Events, family cycling, School, seattle and tagged bike, carfree kids, kids, schools, seattle, walk. Bookmark the permalink.